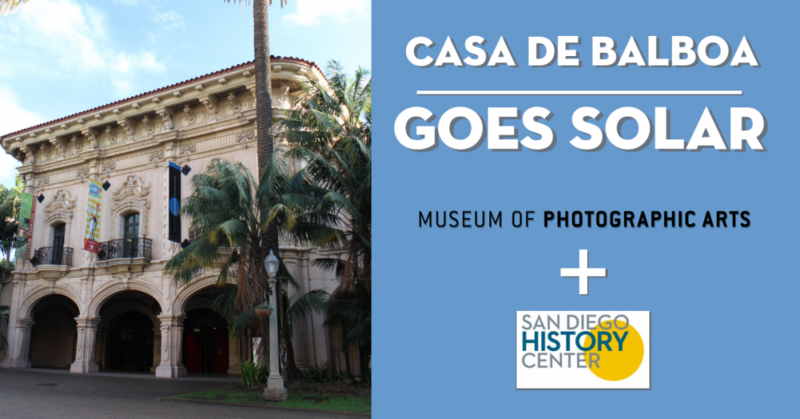 A new solar project has been activated at Casa de Balboa as a joint effort between the Museum of Photographic Arts (MOPA) and the San Diego History Center. This new system of 480 panels is capable of producing 370 watts of power, offsetting the building’s annual energy usage by 23% on average. Within the first year, the solar panels are expected to produce 281,000 kWh of renewable energy for the building. Without this solar project, generating that much energy would release 199 Metric Tons of CO2e 1 into the atmosphere. This is equivalent to the greenhouse gas emissions from 485,842 miles driven by an average passenger vehicle! 1 These panels will also save these two non-profit organizations a shared $62,000 in energy costs, allowing them to put more funds towards their collections and educational programming. This solar project is one of the many ways that the tenants in the Casa de Balboa have modernized their building’s energy profile. Before installing the solar array, these organizations completed a thorough energy auditing program which identified how their building could run more efficiently. Throughout the building, they updated lighting fixtures with LED bulbs and replaced lighting controls with new systems to manage their energy usage throughout the day. MOPA also updated their HVAC systems with efficient replacements to reduce the energy usage of the units that maintain air conditioning for their photographic collections. To expand on these energy efficiency projects, the San Diego History Center and MOPA initially began pursuing solar power three years before the panels’ installation date at the end of 2018. Like other structures in Balboa Park, Casa de Balboa is a historic building, so special precautions had to be taken during this process. The integrity of the roof, aesthetics, and financial costs were all major focuses in the design of the solar array. To ensure all of these factors were properly considered, the tenants of Casa de Balboa worked closely with San Diego Gas & Electric and multiple departments within the City of San Diego. Alongside the other solar installations in Balboa Park, the Museum of Photographic Arts and the San Diego History Center have set another great example for other organizations in Balboa Park to pursue solar power in the future. By offsetting their energy usage with clean and renewable solar energy, these organizations are making a difference, and helping to make Balboa Park the most sustainable urban park in the nation! Work with solar companies who are knowledgeable about the multiple needs of historic buildings and non-profits. Get involved with any historical boards or agencies who manage your building to learn about any concerns they may have about pursing solar on your building. Research information related to the solar project to include in proposals to important stakeholders and decision makers. This can include information like the number of panels, how much money you will save, and the structural details of your building.